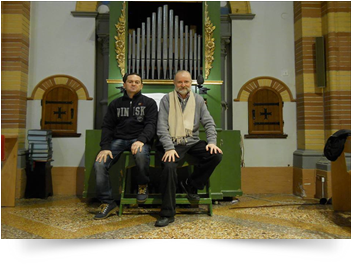 Antonio Seri and Ungarelli Daniele in 1997 opened a company for building and restoring pipes organs; as first work they constructed a little mechanical positive pipes organ with four stops, used in several important concerts. Of particular importance. “Messiah” of G. F. Handel, “Mass in B minor” of J. S. Bach, “Johannes Passion” of J. S. Bach performed by Augsburg Solo and Choir and Munich of Bavaria Radio Orchestra. From 20088 they hold several Masterclasses at the state Conservatory of Pescara “Luisa d’Annunzio” - Institute of high culture- on the argument: “Theoretical and practical notions of the art of building pipe organs”, concerning physics of pipes organ, constructing and intonation pipes organs, organ tuning with historical temperaments. In 2011 at the Department of Music and Entertainment of the University of Bologna, during a seminary of organ building, they presented the Domenico Maria Gentili’s eighteenth century organ they transferred in the library rooms.Till now the company “Seri Antonio and Ungarelli Daniele snc” has made 14 restorations of pipes organs under the guide of the Superintendence of Artistics and Historical Assets - Organs section - ( in particular Giovagnoni’s Organ (1759-1762) of the san Domenico Basilica in Bologna under the advise of M° Luigi Ferdinando Tagliavini). Furthermore the company constructed 4 new pipes organs (including the positive pipes organ of the Church of Saint Edward in Providence - Rhode Island - U.S.A. in 2002. The company made several maintenances of pipes organs in Italy and Rhode Island. The company therefore is specialized in historical restoration of ancient organs and in construction of new organs of every size. Their artesanal firm is also concerned with every kind of repairing and manteinance of organs of every type. They are also experts in ancients Italian and European tuning-up and they work together with the Italian Superintendence for the Historical and Artistical Patrimony as organ experts in all the Italian land. Antonio Seri, born in Bologna (Italy) in 1964, got a diploma with full marks of “Organ and Organ Composition” at the Conservatoire “G. B. Martini” of Bologna in 1988. He was Kappel-Meister of S. Francesco Basilic in Bologna from 1989 to 1992; in this period he performed oratorios of his own composition in Bologna and the neighbourhood and in Rome. He was Organist from 1982 to 1992 and Director from 1992 to 1997 of the Archiepiscopal Music-Kappel of S. Maria dei Servi in Bologna, that is partnership of the “Institute of Italo-Germanic Culture”, with which he had several concerts as organist and as choir and orchestral director: in particular he directed the Communal Theatre Orchestra of Bologna in the performance of “Requiem” of W.A. Mozart and the “B-moll Mass” of J. S. Bach in first performance and repeat performances. At present he carries on an intense activity of concerts as organist soloist (music of Bach, Franck, Mozart, ancient Italian music and present-day authors). He is interpreter, with soloists of the S. Cecilia Academy of Rome (trumpet and tenor), of renaissance and baroque italian music, particularly authors of Bologna of XVI and XVII century. Daniele Ungarelli, born in Bologna (Italy) in 1963, got a diploma with full marks of “Organ and Organ Composition” at the Conservatoire “G. B. Martini” of Bologna in 1989. He graduates in Physics at the University of Bologna in 1993, specialized in musical-acoustics with an original degree-thesis about the physics of the organ pipes. Since 1982 he is Organist and Music Director of S. Domenico Savio Church in Bologna. He had several concerts in Bologna and neighbourhood as organist soloist and as organist accompanist of choirs and instrumental ensembles of sacred music. In particular he played with the Communal Theatre Orchestra of Bologna in the performance of “Requiem” of W.A. Mozart and the “B-moll Mass” of J. S. Bach with the direction of Antonio Seri. At present he carries on an intense activity of concerts as organist soloist, interpreter of renaissance and baroque music.